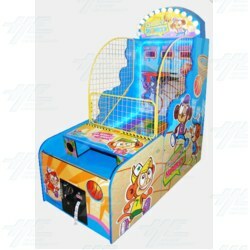 Cheeky Monkey is a Hoop game for children 10 and under. With mini basketballs and a static or stationary hoop. The small cabinet is designed with children accessibility in mind. With 2 levels of play, include a static and stationary basket. Monkeys adorning the cabinet and also included is a jackpot bonus. The small cabinet is designed with children accessibility in mind. With 2 levels of play, include a static and stationary basket. Monkeys adorning the cabinet and also included is a jackpot bonus.